Maverick Viñales sets the pace in the extended FP3 session as last-gasp effort secures Q2 passage for Rossi. Free Practice 3 for the MotoGP™ World Championship was extended to an hour due to the new layout of the Circuit de Barcelona-Catalunya, introduced after the events of Friday. Turn 10 was altered to be tighter while a chicane was added just before the last corner, this layout is used for the F1 race held at the circuit. Back in 2014 during a post race test riders ran the revised layout at Turn 10, but the final chicane was brand new. The new layout also meant that all previous times and records became irrelevant, Free Practice 3 the only session counting towards Q1 and Q2. Having shown well in both Friday sessions, Maverick Viñales (Team Suzuki Ecstar) continued to raise eyebrows. 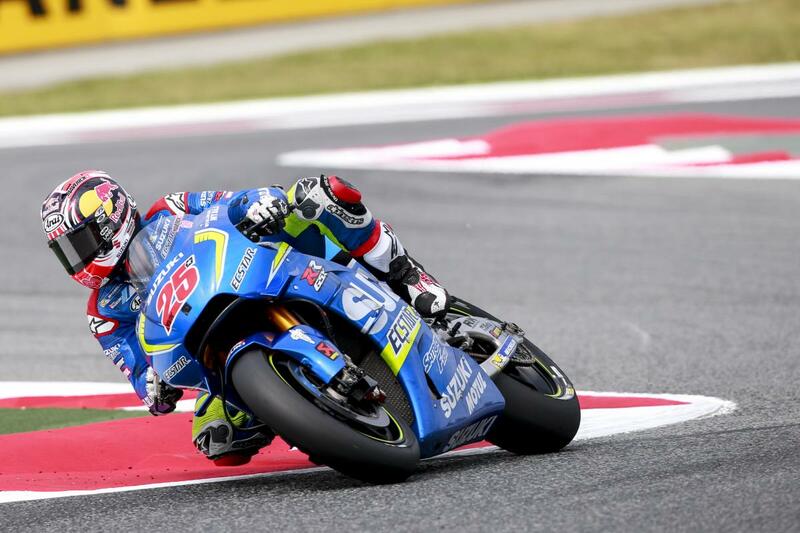 The Suzuki man set a 1’44.727 to lead the session by just over a tenth of a second. Both Suzuki and Viñales continue to make improvements with almost every race, the GSX-RR now able to match the Yamaha riders in terms of outright speed. 0.120s behind Viñales was fellow local rider Marc Marquez (Repsol Honda Team). 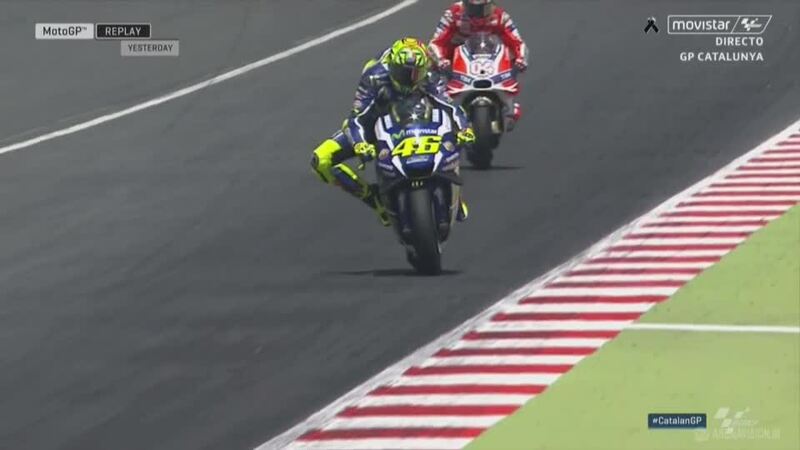 He was back to his wild riding style as he wrestled his RC213V around the tighter fourth sector of the track. It was by no means a perfect session for Marquez who crashed at Turn 2 on his outlap towards the end of the session. His bike sustained a heavy blow but Marquez was fortunately unharmed. 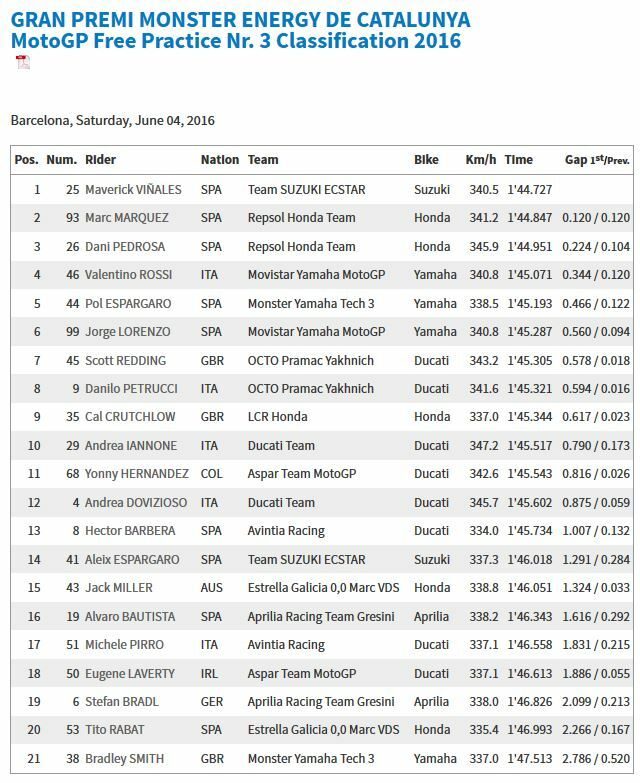 The new layout seems to suit all the Honda riders more than the previous one, Dani Pedrosa (Repsol Honda Team) showing well with third overall, 0.224s from the top and only 0.104s from his teammate. Friday had left the Spaniard incredibly frustrated, but there’s now hope for a strong result on race day. Meanwhile it was a tense session for Valentino Rossi (Movistar Yamaha MotoGP) who found himself outside the top ten as the final minutes of the session began. ‘The Doctor’ put his head down and got to work, setting a series of fast laps to drag himself up to fourth. Fifth was Pol Espargaro (Monster Yamaha Tech 3), the Independent Team rider ahead of Jorge Lorenzo (Movistar Yamaha MotoGP) who was sixth and 0.094s slower. Scott Redding (Octo Pramac Yakhnich), Danilo Petrucci (Octo Pramac Yakhnich), Cal Crutchlow (LCR Honda) and Andrea Iannone (Ducati Team) all finished inside the top ten and will go directly into Q2. With the new layout, Free Practice 3 was the only session which contributed towards Q1/Q2 times. All of the top 13 were within a second of each other, Qualifying set to be a hard fought battle. Andrea Dovizioso (Ducati Team) and Aleix Espargaro (Team Suzuki Ecstar) were two of the bigger names to miss out on direct access to Q2. Bradley Smith (Monster Yamaha Tech 3) was another faller at Turn 2, ending his session early. The Brit was unharmed but will have to contest Q1.